This was A’s choice to listen to as we traveled south for spring break. She’s is a Harry Potter nut, having convinced Hubby to read the first four books out loud to her. So, of course, she wanted to listen to the books again. This wasn’t her first choice, but as K is only not-quite-five, it’s the one that I thought would work best for the family. 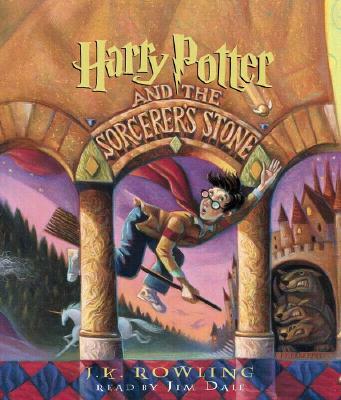 And since I don’t have a review of this book here — I first read it in 1999, for a book club at a children’s bookstore in DC — I thought I’d give my impressions of it, even if everyone knows about the books (and Jim Dale’s reading of it) already. Our first impression was that Jim Dale is a grand narrator, great with suspense and nuance and voices, most of which we liked. Except Hermione. Maybe it’s because by now the movies are really ingrained in our brains, but his Hermione was a whiner. And it drove us all bonkers. Other than that, though, he managed to keep everyone straight for us (and the cast of characters is huge), and kept us engaged in the story. And the story? It’s Harry Potter! It was nice to visit that world again; I haven’t picked up a book since finishing the seventh one several years ago. (And the movies don’t count. Not really.) I was reminded how wonderful Rowling is at world-building, and how much this one stands alone. Though I also noticed details that were picked up in the later books: the big plotlines, of course, but also little things (and dang if I can’t remember them now!). Not to mention all the little ways the book is different from the movie; C — who really didn’t read the books at all — noticed that the most, and even picked up the book when we got home, rereading several sections. In short: it was a good book for a long road trip. I agree completely about Hermoine and the narration. She's a whinging drag the way he voices her. It's always bothered me, particularly as I'd be Hermoine if I was anyone at Hogwarts. It makes me appreciate narrators who can do both genders even more. Susan Deneker, for instance, does amazing things with male voices in the Beka Cooper series.